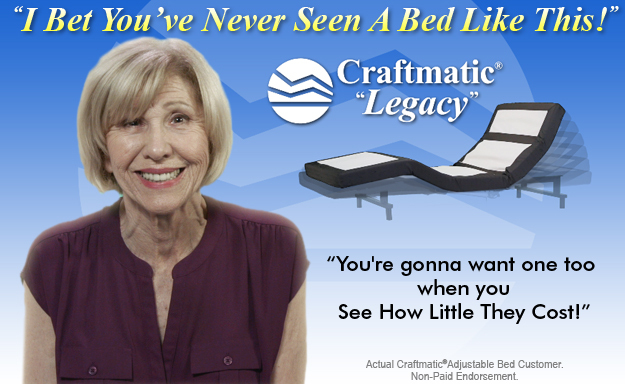 Introducing The All New "Craftmatic® Legacy"
You Get "So Much More" & It "Still Costs Less!" Up to "50% Less" As little as: "Half The Price!" 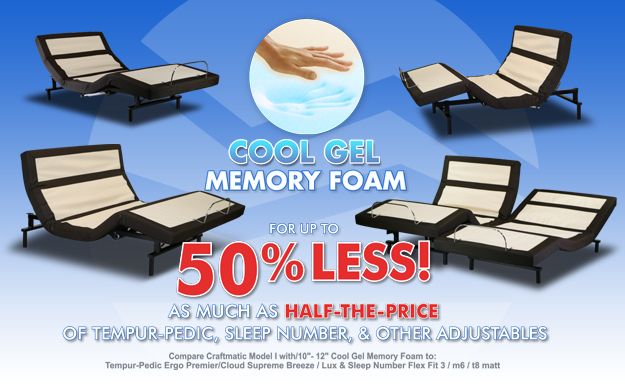 of Tempur-Pedic,Sleep Number, and Other Adjustables! "We looked at flat beds, box springs, mattresses and headboards. 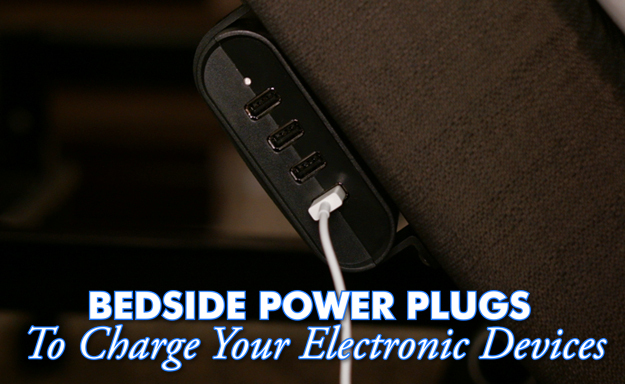 When we added them all up, it was so close to what I paid for my Craftmatic Adjustable Bed." 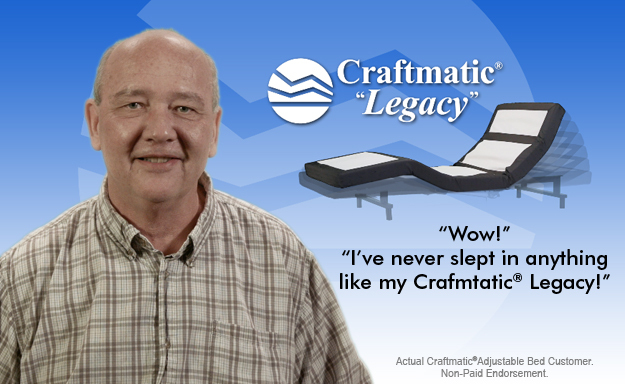 For over 40 years, the Craftmatic® brand has offered over 1 Million people the perfect solution to a good night's sleep! 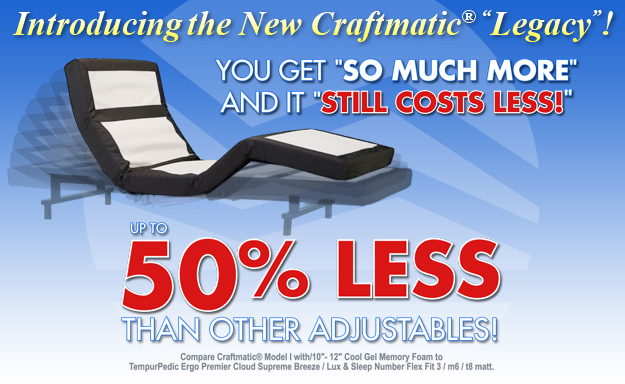 Today, we've Cut our Costs and offer our "Everyday Low Price Guarantee" on every Craftmatic® Brand Adjustable Bed. 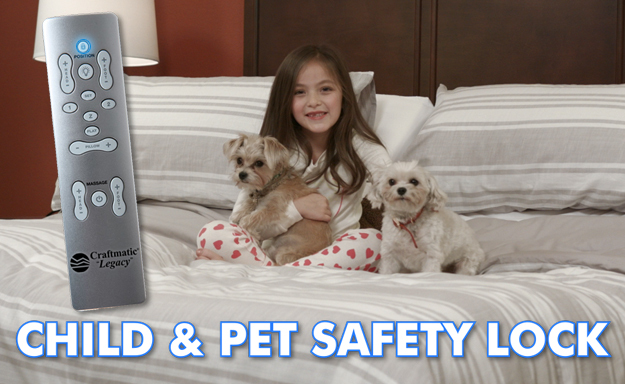 Join our family of happy customers who have made Craftmatic® Adjustable Beds the #1 Name Brand for Adjustable Beds. Craftmatic® Adjustable Beds are available in most mattress types including memory foam, Craftmatic® Beds come in all standard and custom sizes. 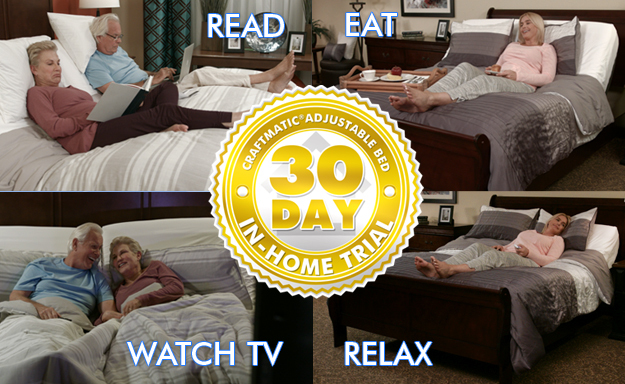 Our 30-Day In Home Trial insures your total satisfaction. Keep it if you like it, Return it if you don't! No questions asked. 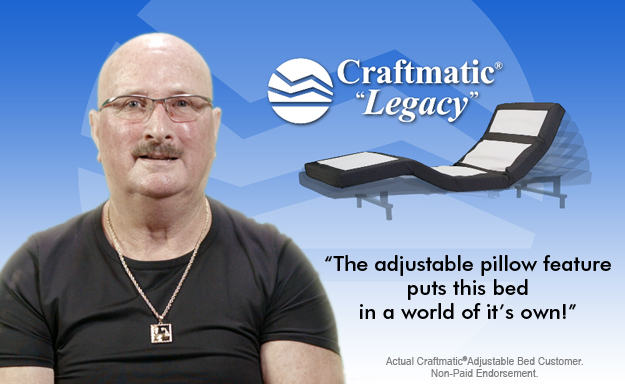 See what some of the over 1 million Craftmatic® Brand Adjustable Bed owners have to say about how their Craftmatic® Beds have helped increase the quality of their lives. No Hassle - No Pressure - No Pain! 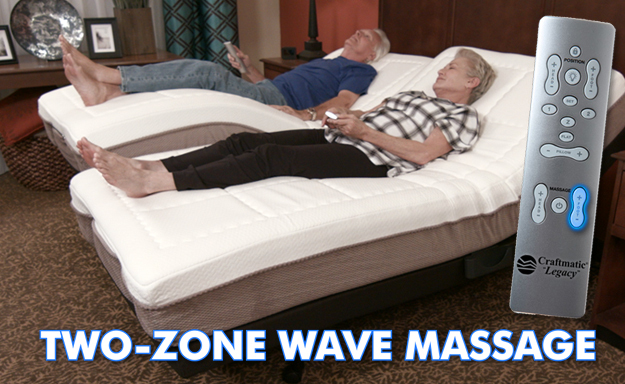 Rest and Relax at the touch of a button! Enjoy Relief and Relaxation. 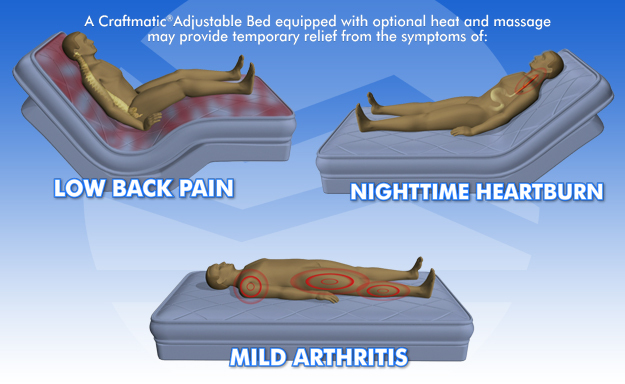 A Craftmatic® Adjustable Bed with optional heat and massage may provide temporary relief from: Low back pain, Edema or swelling of the legs, Poor local blood circulation of the legs, Symptoms of hiatus hernia, gastric reflux, and night time heart burn. Read our health blog to see how it may help you. NO SALESMAN WILL VISIT YOUR HOME. 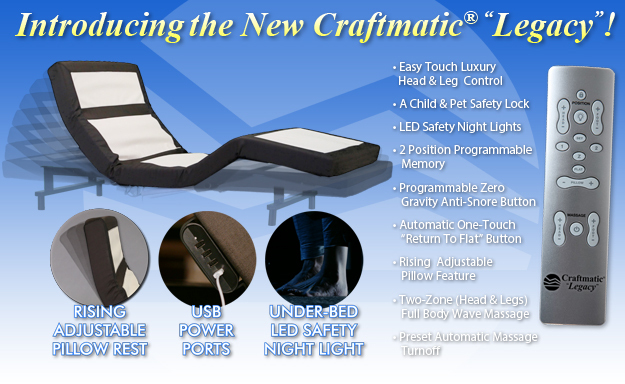 Thank you for visiting the Craftmatic® Adjustable Beds Website. 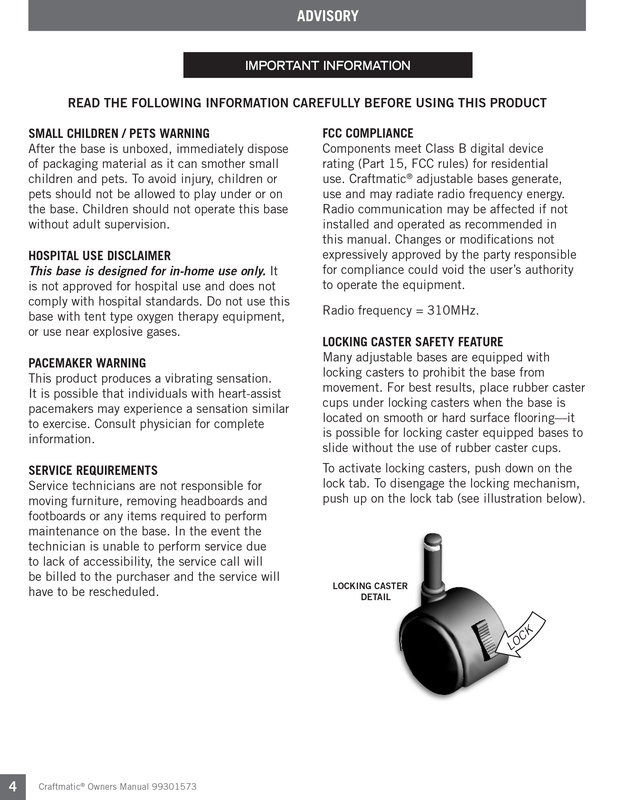 These are just some of the reasons why over 1,000,000 Craftmatic® Beds are in our customer bedrooms around the world! Craftmatic® Adjustable Beds are Built with style, Durable, Great for your health, Reasonably priced, Loaded with options - Find out about our Heat and Massage! You'll never understand how much a Craftmatic® Electric bed may change your life, until you get one. With superior construction, comfort, and adjustability! 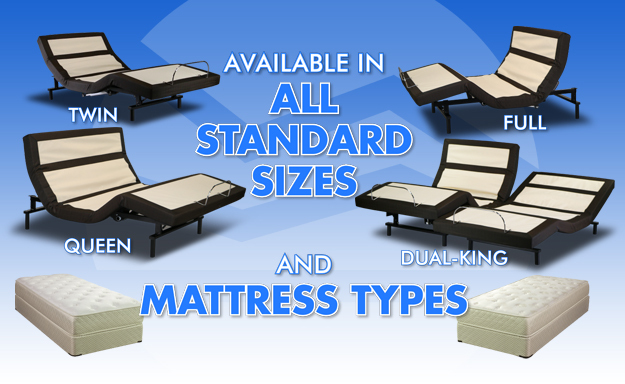 Craftmatic® Adjustable Beds come in several models and sizes, with various optional features and are priced accordingly. 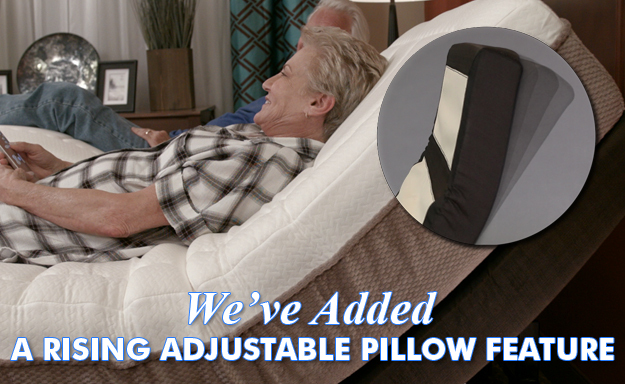 In addition, we will deliver and setup your new Craftmatic® Adjustable Bed nationwide. 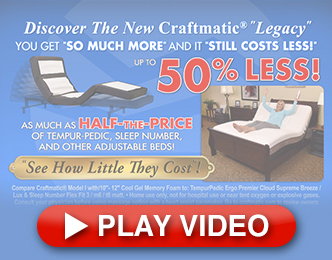 Click through our web pages and discover why a Craftmatic® Adjustable Bed is the very finest sleep system available. Are you getting the absolute best night’s sleep possible? If you’re sleeping on a flat bed the answer is most likely no. Your spine is “S” shaped – a shape that a flat mattress just can’t support. 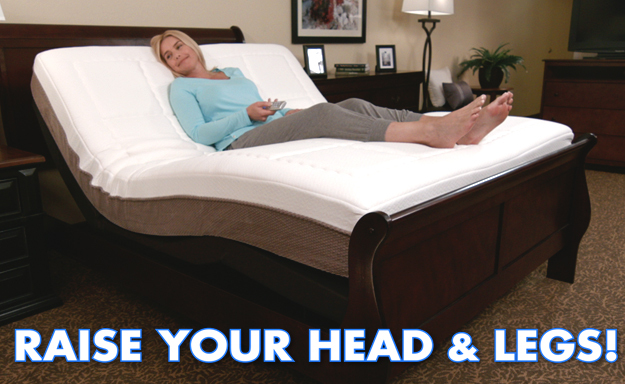 On the other hand, Craftmatic® Adjustable Beds are designed to lift and adjust into more than 1000 different comfortable and oh so relaxing positions to support your head, neck, shoulders, upper and lower back, hips, thighs, legs and feet – it’s like taking a much more comfortable version of your easy chair to bed with you! With our adjustable beds your body weight is evenly distributed on the mattress, so you are able to relax and rest more comfortably. With over 1001 different positions for you to choose from, needless to say Craftmatic® Adjustable Beds are constructed with maximum flexibility in mind. There are countless ways to tweak each setting as necessary, and changing positions is a breeze with the wireless or corded hand control wand. 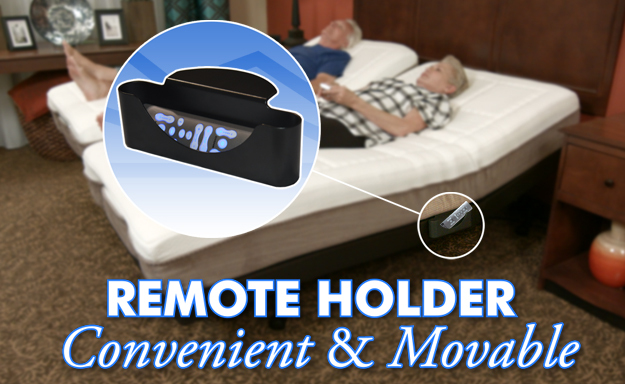 Our Dual Queen and Dual King sized beds come with two hand control wands so you can adjust each side of your Craftmatic® Adjustable Bed separately, and our Model One and Monaco control wands even provide a convenient built-in memory function that memorizes your two favorite bed positions – now that’s the ticket to fast and easy comfort! 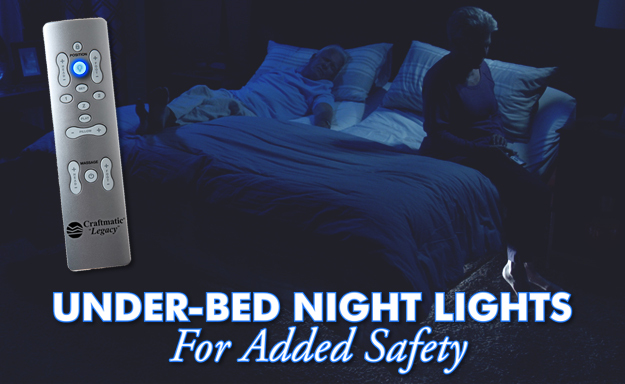 All of our adjustable beds effortlessly attach to a standard sized flat bed headboard with no difficulty. Additionally, our beds’ easy-roll casters make vacuuming and cleaning beneath the Craftmatic® Adjustable Beds as simple as 1-2-3. Because your Craftmatic® bed is fully adjustable, making the bed with fitted sheets isn’t problematic. You won’t need special sheets or bedspreads with your Craftmatic® Adjustable Bed, and in fact, if you buy the same size Craftmatic® Adjustable Bed as your current flat bed, you can continue to use your existing sheets and bedspread. 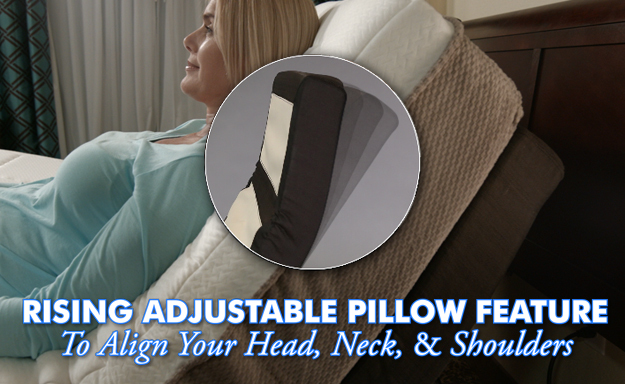 Relax and sleep in the utmost comfort with a Craftmatic® Adjustable Bed today! Home use only, not for hospital use or near tent oxygen or explosive gases. Consult your physician before using massage option with a heart assist pacemaker. 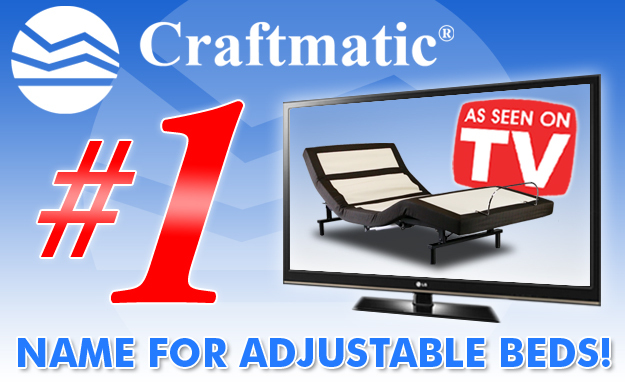 1 Craftmatic® is rated #1 by consumers nationwide on consumeraffairs.com a consumer news advocacy organization.